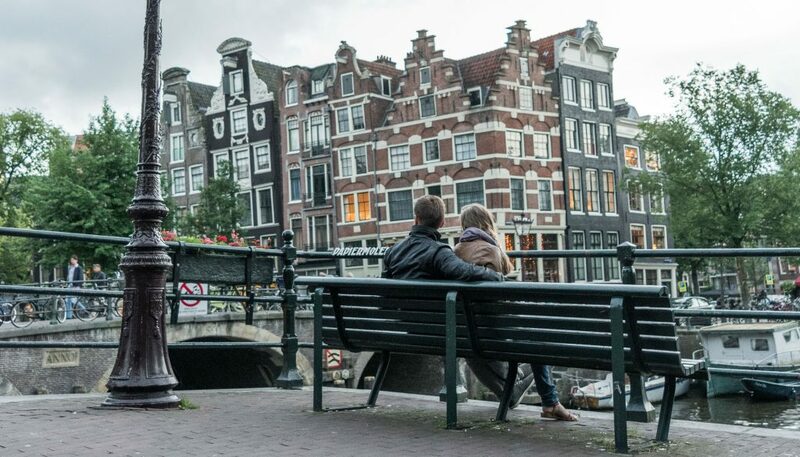 Top 10 photo locations Amsterdam. – Dutchie. The title indicated just what I mean with these photo hot spots. Every local will react with a collective sigh when they see another photograph of one of these places but lets be honest here, this does not make them any less beautiful or iconic. Yes, there is more to this city than these places. But, every non local who comes to visit this magical city should hunt these places down, and get that one pictures everyone else has. Why? Cause we need to see it with out own eyes, capture it with our own perspective and last but nut least create an everlasting memory. My Instagram en direct message inbox is often filled with requests on what “exact” location my photo’s are taken so let me start here with giving you all the exact locations of these 10 places so you can easily find them when you are in town. Want me to guide you thru my city so you can find these places without getting lost? 😉 Drop me a message via this page and i’m happy to talk about the options for you. One last note before I kick of my first top 10 here. Let’s just say these 10 are in random order, and I’m more interested in hearing what your favourite is than telling you this is number one to ten for me. 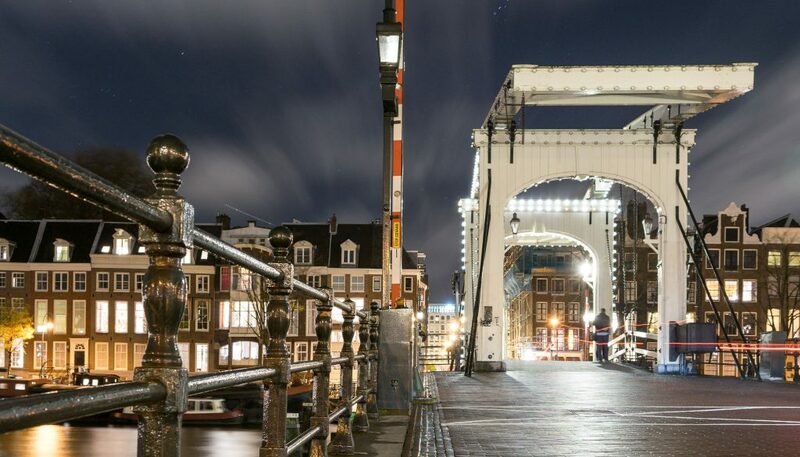 This bridge crosses the Amstel river and connects the Nieuwe Kerkstraat with the Kerkstraat and is located in between the Keizersgracht and the Prinsengracht. If you ever made it onto one of the canal cruise tour boats you have likely passed under this bridge. 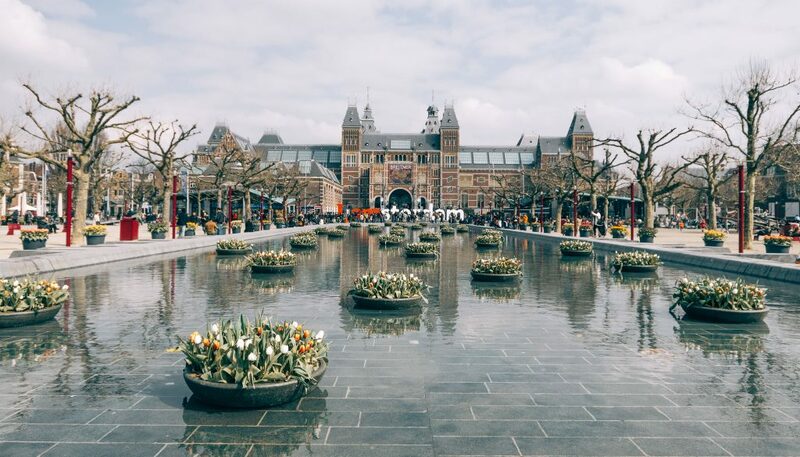 Even though the museumplein isn’t all the pretty is you ask me, the presence of the IAmsterdam letters and the Rijksmuseum in the background makes this location as iconic as they get for Amsterdam. Apart from this view, the square hosts some pretty iconic museums as well in the van Gogh, the Rijks and the Stedelijk museum. 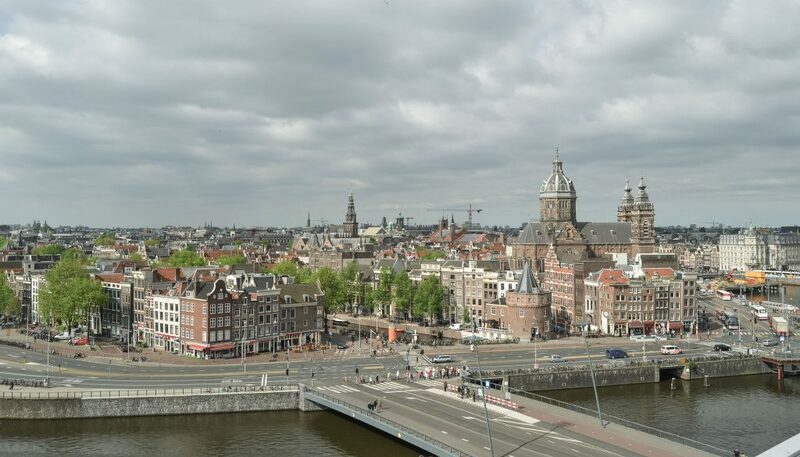 Our buildings in Amsterdam do not go up very high, and the city centre is tiny compared to the other major cities in the world, so when you are outside at this rooftop bar located on the 11th floor of the Hilton the view is pretty darn amazing. What makes this view so special in my opinion? The hotel isn’t bothered by other buildings taking away from the view, you get to see the St.Nicolaas church, and it’s located right in the city centre so the view starts very nearby. If you decide to visit this bar for the view and a drink, do keep in mind the prices are pretty up in the air as well. But let me admit the ambiance and view is on another level as well. You’ll be able to find this piece of street art right above the water at the Grimburgwal. 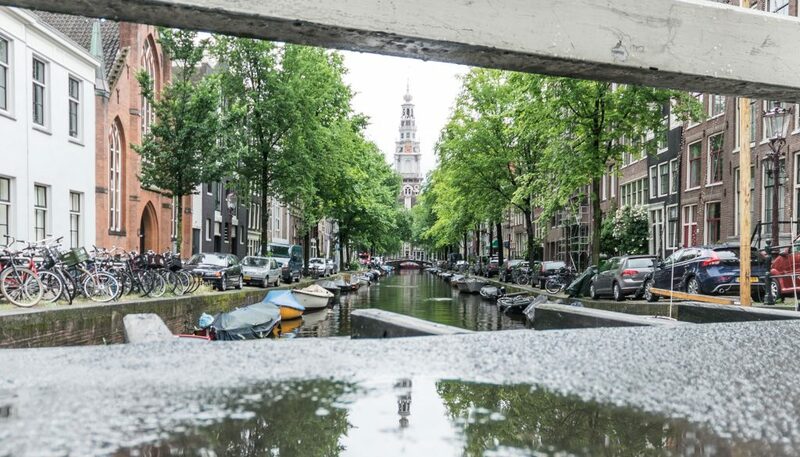 When you walk thru the Staalstraat and pass the Groenburgwal you have this amazing view on the Zuiderkerk which is aligned perfectly with this canal. 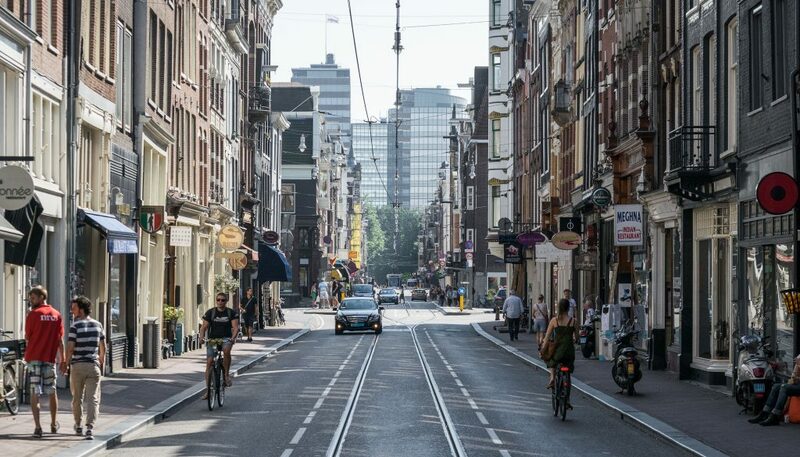 How much more typical Amsterdam can it get right? 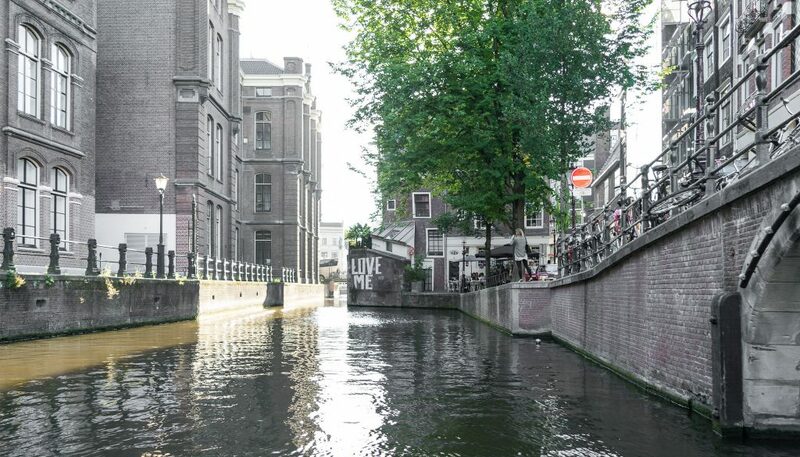 A small canal, boats, classic Amsterdam architecture, a church, probably some bikes somewhere. These houses seem to rise out of the water and are located near the St Olofssteeg. 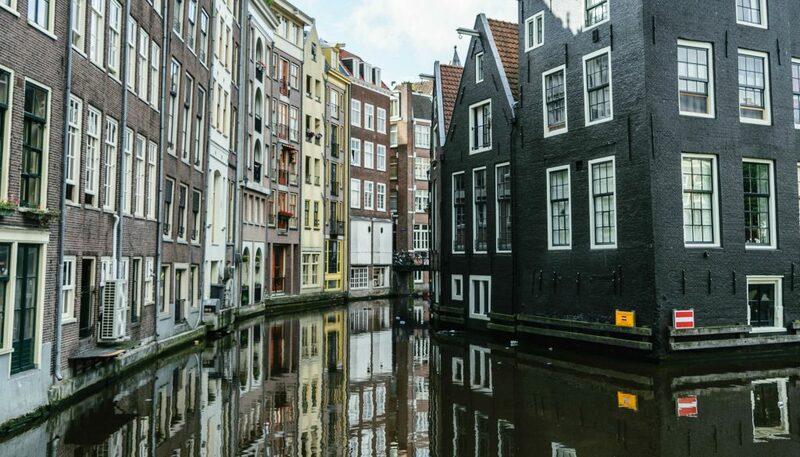 The same goes for the houses very nearby at the Damrak so i’m combining these two places. As not visually attractive as the Rembrandtplein might be, the street that’s right around the corner is as pretty as Amsterdam streets get. 8. 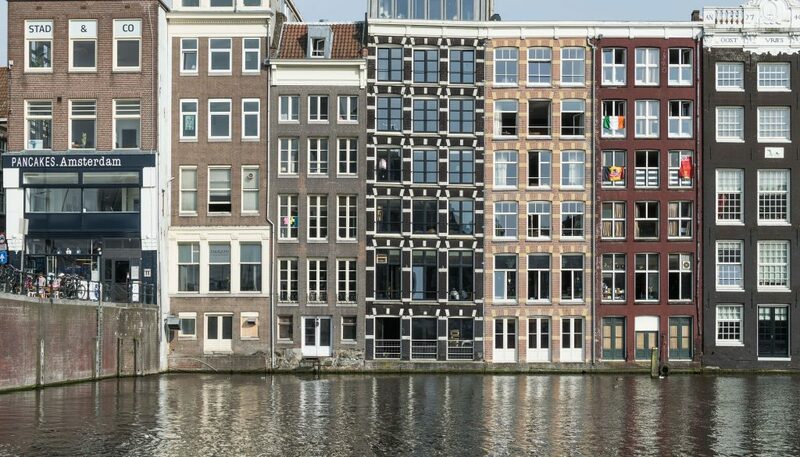 Houses on the corner of Brouwersgracht / prinsengracht. 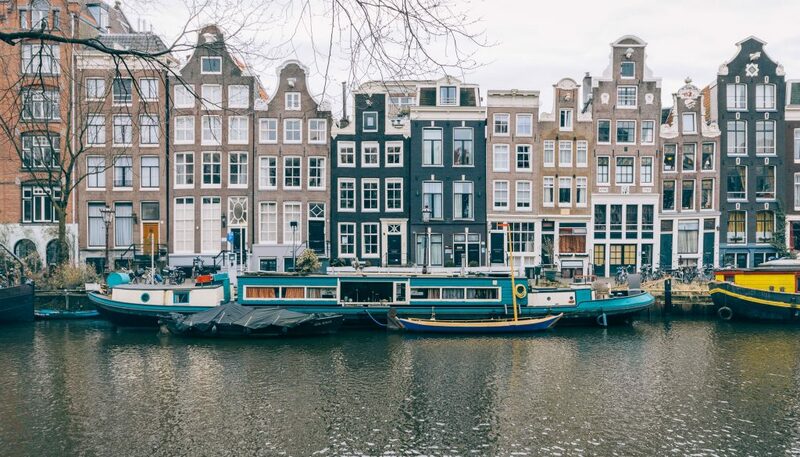 This must be the most beautiful spot of iconic Amsterdam houses in the city. Canals at either side of them, bikes everywhere and more tourists then you want to see in your photo. Locals all around you as well, hanging to enjoy the view, have lunch on the lunchbreak or going from once place to another, this place is always busy. During sunset photographers gather to take more and more pictures of this beautiful place. 10. Reguliersbreestraat and (again) Munttoren. Yes, it’s the Muntplein and Munttoren again. But this view is completely different from the one I mentioned before. 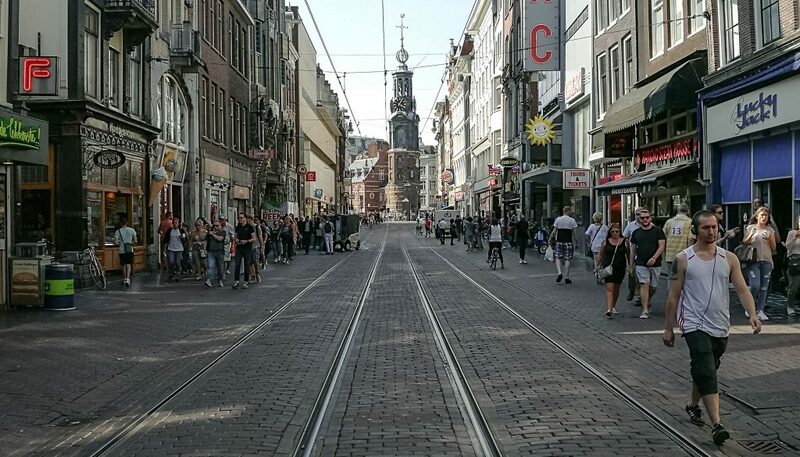 When you leave the Rembrandtplein and head towards the Kalverstraat, or the Flowermarket, you most likely will pass thru junkfood street, ehh.. the Reguliersbreestraat. Here you’ll find all the crappy food choices you’ll need. From McDonals, to Burgerkind, to subway, to newyork pizza (which is totally unknown in… you’ll guess… New york city.) to Febo, to.. well you get the point. Look past all these places you rather not visit, nor see, and look at this street thru your camera. See the lines and the tower in the background, and I’m sure you will have to admit, the photo you just took here is pretty good. So this sums up this top 10 list, i’m sure you think I missed quite some locations and have your personal favourite. Do me a favour here and let me know which ones you think surely need to be in this list. But do keep in mind that this is as much about the obvious place, as its about the beauty in it. There are hidden gems, and you have places like this. The ones everyone knows about.